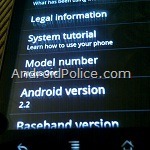 There has been a lot of speculation about the features of Android 2.2, codenamed “Frozen Yogurt” or “Froyo” for short. I have been fortunate enough to have had plenty of time to work with a 2.2 device, using it as my day-to-day smartphone. Now that Froyo has been announced at Google IO, lifting the embargo on the non-disclosure agreement of what Android 2.2 brings to the general public, we are bringing you some notes on the new features I have been taking for granted for the past few weeks. 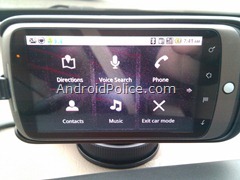 Quick update from the Android Blog: "Android 2.2 will be here soon, and some devices will get the update in the coming weeks." More official notes can be found here. New Marketplace feature: over-the-air music sync, a web-based iTunes competitor? This following part of the write-up is based on a developer release of Android 2.2 Froyo and doesn't include some of the features announced at Google I/O, listed above. 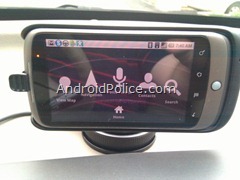 It looks like some features were not disclosed at the conference, such as the color trackball and car dock enhancements. As we previously reported, Froyo got quite a speed boost, which is due to the Just-In-Time compiler. 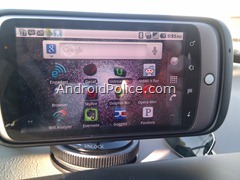 I’ve benchmarked the Nexus One as high as 39-and-change MFLOPS since our original post. Another benchmark I’ve been able to determine though: boot time is much faster. 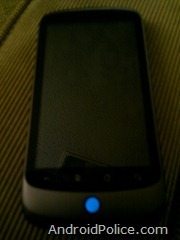 I clocked the Froyo-based Nexus One from first logo sequence through network connection in 72 seconds. 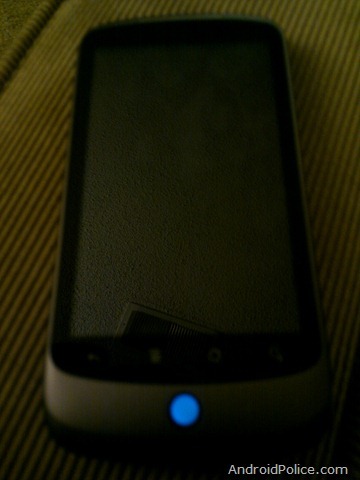 My Android 2.1 Nexus One took over 120 seconds (two minutes) to fully boot and be ready for use. 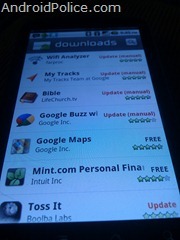 Similar apps are installed on both devices to keep this benchmark fair. This has been covered by Adobe and several other sites. Adobe has even gone to the trouble of compiling several mobile-friendly sites for major devices such as the Nexus One, Palm Pre and Motorola Droid which will lead users to web sites utilizing Flash. It’s uncertain yet when Flash 10.1 will be fully released; speculation is June 2010. From the screenshots above, we can see the new “Update all” button at the bottom of the Downloads panel of the Android Market. It’s important to note that the button only appears if you have multiple apps that do not need a *manual* update like the Bible reader which requires a permission change. Permissions have changed for 1 of 7 apps with updates available. 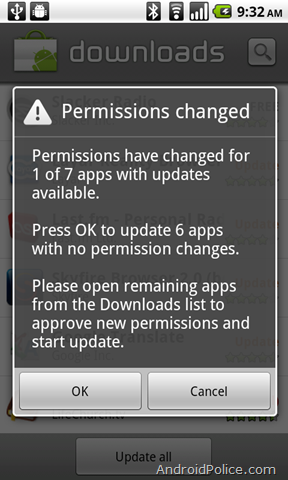 Press OK to update 6 apps with no permission changes. 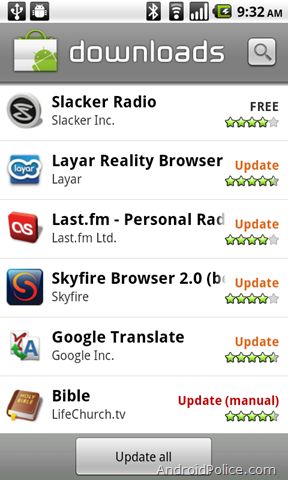 Please open remaining apps from the Downloads list to approve new permissions and start update. Tapping the OK button begins the download process, as seen in the third screenshot. Once the apps have started downloading, you can exit the Market and multitask. If you pull down the Notification bar at the top of the screen, you can get an update of which apps are still downloading, as seen in the fourth screenshot. 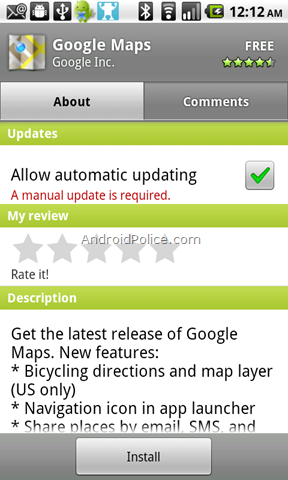 Froyo also includes the means to let the user flag individual apps for auto-updates, provided that the permissions of the app do not change. 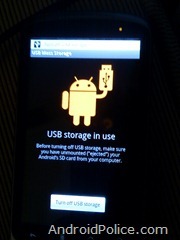 This has already been covered here at AndroidPolice.com. 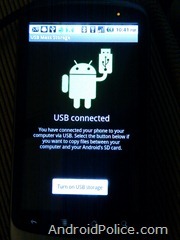 Android 2.2 will allow a device to act as a WiFi Hotspot, and also allow USB tethering to a computer to provide a single device with Internet access. I was unable to determine how many devices could connect to the hotspot, and the developer version of Android 2.2 only had ‘Open’ wifi working; the only option for encrypted wifi was WPA2-SPK and was not working properly. Though custom ROM builds such as Cyanogen have been doing this for a while, this is neat eye candy. This feature, of course, applies to the Nexus One, but other devices may gain some new comparable feature. 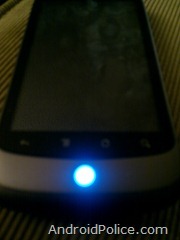 While new Email and SMS notifications still cause the trackball to glow white, installing Twidroid showed a neat new feature: a BLUE trackball when a new tweet was downloaded -- talk about color/brand tie-in! 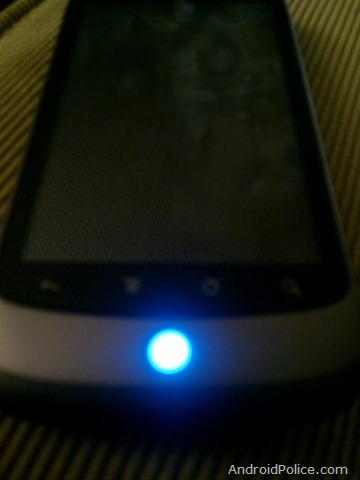 There does not seem to be any means to let the user customize the trackball color within the operating system. While this may not be earth-shattering, Froyo has added some friendlier screens within the OS which new users may appreciate. 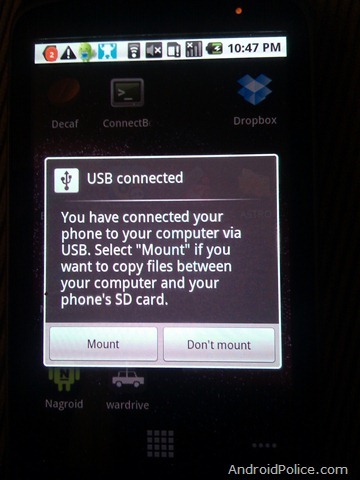 The first photo gives you a friendlier message about USB connectivity, and a second screen with an Android mascot of a different color with a warning to ‘eject’ the device from your computer first. 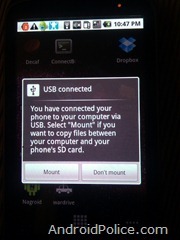 It’s important to note that the user still has to manually pull down the Notification bar and tap the icon to connect via USB. The Directions button is the same as the View Map button from 2.1, and you can access Navigation from within the Google Maps app that gets launched. Other changes I noted was that once you exit Car Home mode, tapping the Home button on the Nexus One does not return you to Car Home mode, it keeps you at the basic Android desktop; you need to manually restart the Car Home application. It was also a nice surprise to see that while in the Google Car Dock, the main Android Desktop is also rotated, something that 2.1 was not capable of.